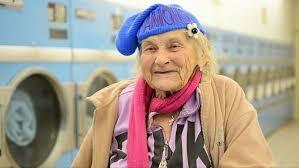 Marie ‘Mimi’ Haist slept in a laundromat for 18 years. Homeless and in her 50s, she survived off tips from customers cleaning the floors and folding clothes. One day, a struggling actor named Zack walked in. He noticed Mimi sitting in the corner, on the same plastic chair she ate on and slept in. He smiled at her. Mimi got up and offered to help him with his laundry. It was the beginning of a lifelong friendship. Whenever she saw Zack discouraged, Mimi would tell him: When life deals you lemons, just make a lemon drop martini! One day, Zack asked Mimi why she was so kind to him. Mimi laughed and said that years ago she found herself divorced, jobless and homeless. Her husband of 29 years had left her with nothing. Every night she wrapped herself in a sleeping bag behind the bushes and dreamed of a better life. One cold and rainy evening, Mimi couldn’t find shelter. A stranger took pity on her and let her sleep inside laundromat. The next day, Mimi swept the floor and helped customers with their clothes. The owner was so pleased with her work that he gave her a key to the laundromat. Mimi told Zack she believed in him as much as that man had believed in her. Zack took care of Mimi and brought her anything she needed. But as the years went by, Mimi saw Zack less and less. Until one day he barged in smiling with good news. Zack finally got a role in a movie ‘The Hangover’ . Mimi wished him well and Zack promised he would keep in touch. He checked up on her whenever he was in town. When Zack learned Mimi had become homeless, he bought her a one-bedroom apartment and stated paying for her utilities. To this day , Zack continues to visit Mimi and bring her groceries. He also took her to the movie premiere of Hangover II. When Zack has tickets to other events, he sends them over to Mimi and she takes a friend . Mimi dressed up nice and her friend helped for makeup. She said , ‘It was fun, not something I’ve ever dreamed I’d experience. The limo takes me home afterwards. Despite living in the spotlight, Mimi never forgot where she came from. Now in her 90s, she still visits the laundromat every day to do her own laundry this time. Her story reminds us that simple act of kindness goes a long way.